How did the Summer of Love begin? In January 1967, San Francisco’s nascent hippie community held a “gathering of the tribes”—called the Human Be-In—in the city’s Golden Gate Park. At least 20,000 people came, many long-haired and wearing outlandish costumes, to protest a new California law banning the drug LSD, which was freely distributed to the crowd. The beatnik poet Allen Ginsberg led a mass “om” chant, while the LSD guru Timothy Leary (see box) invited the protesters to “turn on, tune in, drop out.” Music was provided by local psychedelic rock bands, including the Grateful Dead and Jefferson Airplane. It was the first of the year’s major “happenings,” and it generated national publicity. In the spring, a self-appointed hippie “council” invited the youth of America to San Francisco to experience the magic for themselves, during what it called the Summer of Love. Starting at spring break, some 75,000 to 100,000 young people converged on the city, inspired by the prospect of a new way of life centered on free love, communal living, and psychedelic drugs. At the epicenter of the counterculture was the down-at-the-heels district of Haight-Ashbury, which had been colonized by a number of alternative communities. Scott McKenzie’s ballad “San Francisco (Be Sure to Wear Flowers in Your Hair),” a siren call to youth, became an immediate hit on its release in May. Mainstream America watched aghast as TV and newspapers provided daily coverage of the antics of the “flower children.” The biggest of the summer’s many gatherings was the Monterey Pop Festival in June, the first major festival of its type, where a crowd 60,000-strong witnessed performances by Jimi Hendrix, Otis Redding, Jefferson Airplane, and another local band, Big Brother and the Holding Company—fronted by Janis Joplin. Why was San Francisco the focal point? Throughout the 1950s and ’60s, San Francisco and the Bay Area attracted artists and those looking for a bohemian lifestyle. Beatnik icons including Ginsberg, Jack Kerouac, William Burroughs, and Neal Cassady lived and wrote in the city’s North Beach neighborhood. Their works— which sowed the seeds of the hippie revolution— expressed contempt for the cultural norms of 1950s America and encouraged spiritual questing, sexual liberation, experimentation with drugs, and a rejection of materialism. There was also a large, radical student community in the area, based around its various universities and colleges. 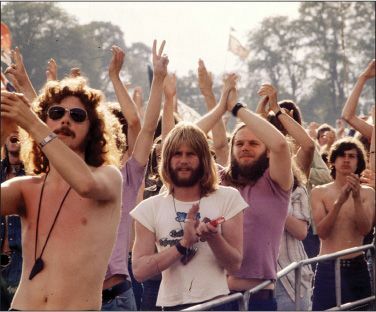 And who were ‘the hippies’? They were essentially an assortment of like-minded “tribes” based in the Bay Area at the time. Ken Kesey’s Merry Pranksters toured in a graffiti-covered school bus driven by Cassady, and offered free “Acid Tests”—with LSDlaced Kool-Aid, and diplomas for those who “passed.” In Haight-Ashbury, there were groups such as the Family Dog, who lived communally and did much to popularize the fashion for long hair and “old-timey” clothes, and the Diggers, “community anarchists” who sought to create a society free of money. The San Francisco Chronicle columnist Herb Caen dubbed these young bohemians “hippies”—a slang term for someone who is “hip,” or in the know. How did the summer end? Did hippies change the world?